Welcome to the November 2010 edition of K Monthly, a look back at some of the best original video game coverage, including reviews, previews, features, and weekly columns, from Kotaku. November was full of new releases, from Kinect for Xbox 360 to big blockbuster games like Call of Duty: Black Ops, Assassin's Creed Brotherhood, Gran Turismo 5, Donkey Kong Country Returns, GoldenEye and Need For Speed: Hot Pursuit. Kotaku published its annual video game gift guides in November, a rundown of the best games to give and get for every platform. 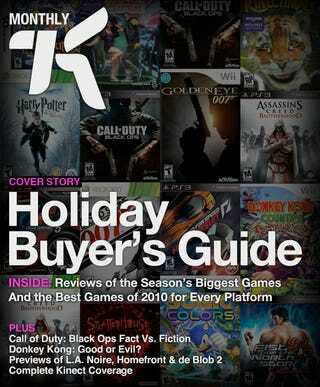 Read the reviews, previews, special features and other highlights from November 2010 below.